A Return To The Breath. Ink on Chinese mulberry paper, mounted on cartridge on canvas, 24 carat gold leaf. 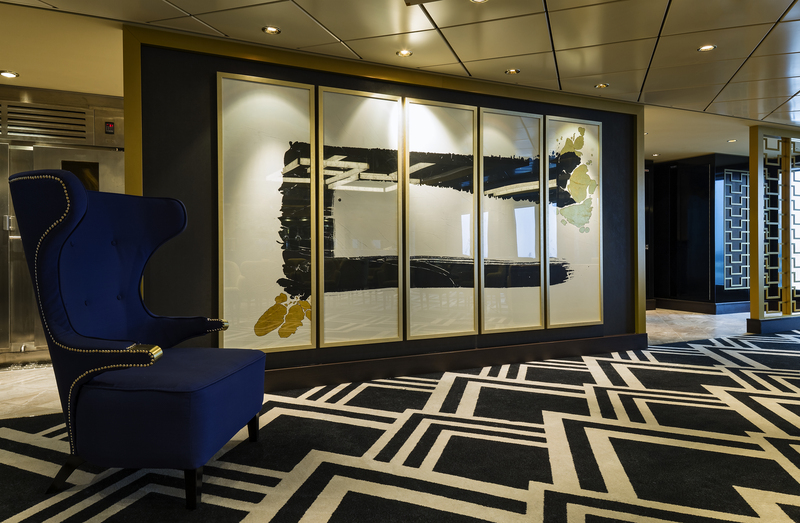 A commission for two multi-panelled paintings came from SMC Art Consultancy for a VIP Restaurant aboard a newly commissioned cruise liner within the Dream Cruise fleet. Operating out of Hong Kong. The two works; ‘A Return To The Breath‘ and ‘A Moment Within‘ are my largest completed works. ‘A Return to The Breath’, is a line taken for a journey across the paper (than spans five panels) it is a metaphor for the journey the on board guests are on, as well as for life. That is, whilst we may get caught up in moving forward and the pace of the journey and a final destination. We have every opportunity to slow things down, or to pause; to find our breath and bring our attention to the present. This mark was created with a four part breath; inhale, hold, exhale and pause. A yoga breath that is calming and grounding. ‘The Moment Within’, the enso (circle) is a motif that recurs in my paintings. It is practice of drawing a circle with a single uninhibited brushstroke to express a moment in time. That for the artist is when their mind is free to simply let themselves create through the physical body. It is a symbol rich in associations. For me it is an act of meditation. I approached this piece with the intention of creating a triptych that allowed the viewer a moment to pause and reflect. Turning their gaze inwards on themselves as well as outwards to their experiences aboard the ship as it travels the seas. I use 24 carat gold leaf to gild the drips of the ink as the brush comes to and leaves the paper, to signify the potential of the ink within the circle. I have undertaken direct private commissions for work to go in either home or corporate settings. If you would like to know more about the commissioning process. Please use the contact form.